Ever since hearing about and making Mark Bittman’s wonderful no-knead bread, I’ve been hooked on making my own loaves at home in the comfort of our kitchen. I am no pastry chef or expert baker by any stretch of the imagination, but within the past year I have jumped over hurdles of pastry intimidation and the air of pretension that tends to, most rightfully so, tag along with crafting artisan foods, chief among them: bread. 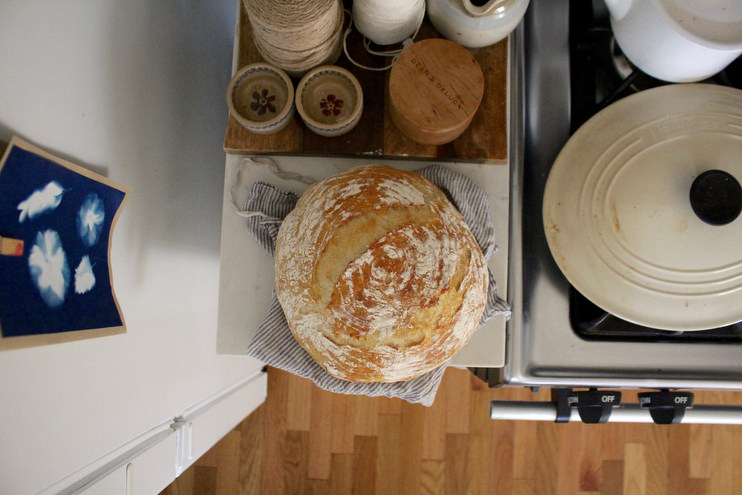 Though a complex process if you want it to be, I love that bread making can also be done simply at home. Homemade bread consists of a few quality ingredients, some patience, and a hot oven. That’s really about it. 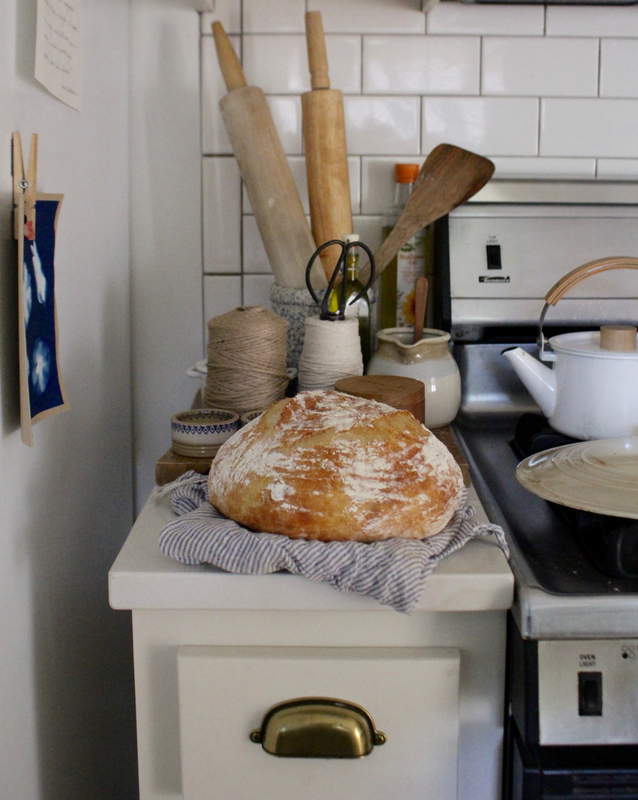 It’s especially wonderful to have homemade bread in the colder months when heating the oven to 450 degree is more of a treat than another reason to sweat on a hot summer’s day. But let’s not joke around here, I’ll take and make bread no matter the season and no matter the heat index outside. My love for bread knows no bounds. This recipe below is one I’ve tinkered and toyed with several times, six to be exact, before feeling fully satisfied to share it here with you. It’s one I’ve adapted from an old but trustee recipe (see link above), whereupon I’ve proven to myself that one can indeed fiddle with baked goods and get pretty darn good results. Now there will undoubtedly be bread makers out there who will deem this recipe a bit of a cheap shot at making bread, and they are right. It is. This recipe aims to get homemade bread on your table fast, a word you almost never associate with good bread, but for whatever reason it here it works. I stand by this recipe not only because of it’s speedy results, but because it is very delicious. I recommend slathering it well with full-fat butter, sprinkled with fancy salt. Fleur de sel is a revelation on a slice if you have it. And if you dare take things a step further, top it with butter and raspberry Bonne Maman jam. You’ll have one beautiful breakfast or snack. To prepare, mix the bread flour, dry active yeast, and salt in a large bowl. Once mixed, add warm water and mix well using a large wood spoon. There should not be any extra flour on the sides of your bowl and the dough should look a bit shaggy when done. Cover your bowl with a towel or saran wrap and leave it be, preferably somewhere warm like on a sunny table top or on your refrigerator, for at least 3 hours. If you happen to leave it for 6 no biggie. I like making my bread mixture before church on Sunday around 8 am, and I’ll get back to it after brunch and laying the boys down for naps around noon. At this point, your bread dough should have lots of bubbles on the surface, so go ahead and preheat your oven. You’ll want it really hot, so set the temperature for 450 degrees and put your dutch oven inside with the lid on while it heats up. I use my large 8 quart Le Creuset for this and it works really well. Dust a work surface or countertop and scoop the dough out onto it. The dough should be really sticky at this point, so dust those hands of yours with flour to keep the dough together. Fold the dough over several times on itself as if you were sloppily wrapping a present, 2-3 times works, and then dust your proofing basket. I truly look forward to every post you write, you feel like an old friend and kindred spirit. I’m a new mum of a beautiful 7 month old boy and I’m so thankful to have other mamas like you leading me down such a thoughtful path. After college I went to pastry school for 9 months and I am still too intimated to make bread at home. It’s been years! This recipe looks great and simple enough. I am definitely going to try it. Thank you for sharing. I have a similar Le Creuset pot but was under the impression that the top black knob isn’t oven proof? Has your has ever cracked in the oven? Can’t wait to try this! I’ve been making Jim Lahey’sbread on and off for years and years. 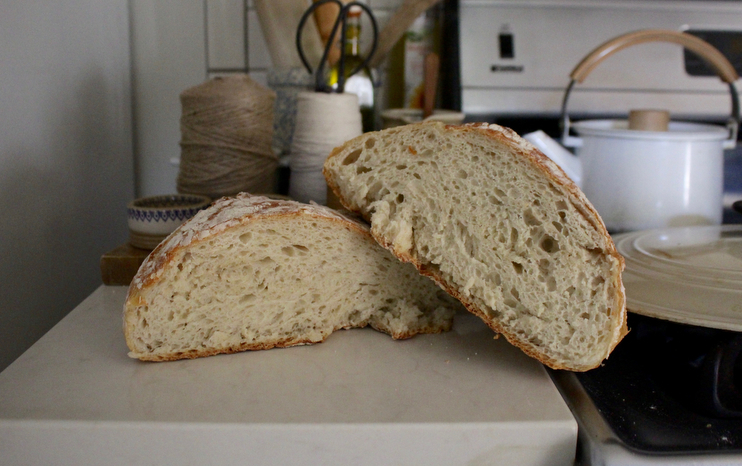 I was first introduced to breadmaking using the Artisan Bread in 5 method, which is very similar to yours (except you keep extra dough in the fridge, and pull off/let rise/bake when you want fresh bread). I’m curious about the size proofing basket you use, I just ordered an 8.5 inch but it seems kind of small. Also any tips when first using the basket? Do you remove the liner? Looks so yummy! Thank you for sharing this.